Halloween at Crich Tramway Village. Crich Tramway Village will host a Winter’s Eve Folklore Festival offering a host of activities for all the family. Running from October 30 to November 3, the activites vary each day and will include willow weaving, children’s crafts, sewing workshops, ghost talks and National Tramway Museum talks, plus a funfair all week. Children wearing Halloween costume on October 31 will receive free admission, so it’s a great venue for the children to take vintage tram rides, engage in craft making and visit the face painter and balloon modeller. If you enjoy jugglers, it’s your chance to see ‘The Daddy of all Mummies’ juggling. Andy Martin will be providing live folk music in the Red Lion pub on Monday, Wednesday and Thursday from 5pm to 7pm. Thursday will see entertainment from the Ripley Morris Dancers, while Friday offers a range of entertainment for the children, from face painter and fire eater to Guy making and roaming magician. As a thank you to the Heritage Lottery Fund for their support, there will be free admission on Saturday, November 4, for any adult purchasing a Lotto ticket for the Lotto draw on that date. Follow the campaign on Twitter: #ThanksToYou. The residents of Crich are also entitled to free admission on Saturday, November 4 (proof of residency required). Sunday, November 5, is the final day of the season and in preparation for a major depot refurbishment, many of the trams will be being moved in the ‘Big Tram Shunt’, providing great photo opportunities. 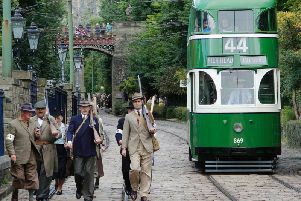 For more details, visit www.tramway.co.uk or call 01773 854321.